Uh oh. This gal had better get reading! Flavorwire recently put out a list of the best books of the year, so far. I've only read ONE of them. One! I do have a few of them on request from my local library, whew. (Thank you ever so much to The Weiss Community Library!) The rest of the books are now filed in my READ IT SOON file! The one book that I have already read from the list? The Orphan Master's Son by Adam Johnson. This is towering, epic, an honest to goodness masterpiece in my humble opinion. 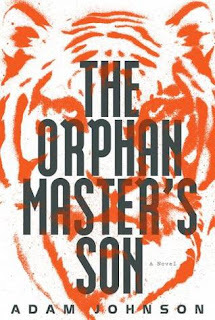 Per Goodreads: An epic novel and a thrilling literary discovery, The Orphan Master’s Sonfollows a young man’s journey through the icy waters, dark tunnels, and eerie spy chambers of the world’s most mysterious dictatorship, North Korea. Have you read it? What did you think? I'd love to hear your thoughts! Hi Jennifer - While I have not read this I recently heard an interview with Adam Johnson. This book looks fascinating but a little disturbing. North Korea is truly an amazing and horrendous place. I think that it may come closer to the society depicted in George Orwell's Nineteen - Eighty - Four then any other. I don't think I'd ever read another novel set in North Korea. Anyone who pays any attention to the news has a vague understanding that it's a much different place than the US (or anywhere else for that matter!) If you read this you'll have to let me know what you think. It *was* disturbing, and eye opening and fascinating as well. I might have to search out an interview with the author, I'd really like to hear what he has to say. I loved this book! I can't quite put my finger on what exactly because I do think it has a few flaws but those, too, are vague. I just know that I laughed and cried through the whole thing.